In modern trucks and buses, oil pressure sensors monitor the oil pressure in the motor oil and transmission oil circuit. The measured pressures are recorded in real time in the control unit of the vehicle, evaluated and used to optimise engine parameters. The result is fuel-saving, low emission and more efficient engine operation. The oil pressure is recorded by the oil pressure sensors via a sensor element. Due to changing pressure, a thin aluminium oxide membrane on the sensor is deformed. This change is converted into electrical voltage and reported to the control unit of the vehicle. 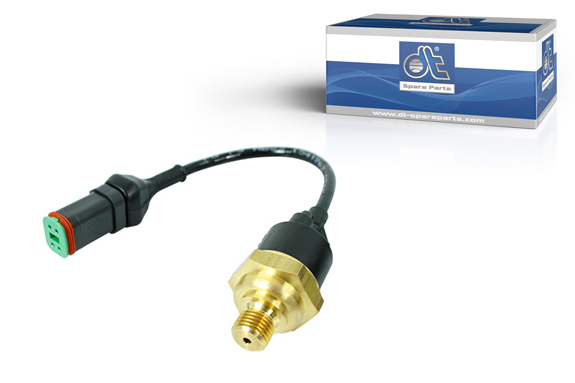 Modern oil pressure sensors of the DT® Spare Parts brand have temperature compensation. When measuring the pressure, the effects of the ambient temperature are compensated, leading to precise measurement results. The maximum deviation from the actual oil pressure is well below 0.5 %. Oil pressure sensors of the DT® Spare Parts brand fulfil the high quality and safety standards of the automotive industry and enable a long-term function under all operating conditions. They are designed for a temperature range from -40°C to +150°C and deliver accurate measurement results even at extreme ambient temperatures. During production, small and light components are used. The components are securely fastened to a high-strength printed circuit board with special tin solder. By this method, a high resistance to vibration is achieved, which ensures a long service life of the oil pressure sensor. The connectors of the sensors correspond to protection class IP 67. They are protected against dust and splash water and are secured by a special plug connector. The cable connector made of PU provides maximum resistance against environmental influences and is thermoplastically sealed at the ends. Seal rings made of fuel and oil-resistant FPM reliably protect the inner circuitry against moisture and dirt. Furthermore, oil pressure sensors of the DT® Spare Parts brand are RoHS-compliant and contain only environmentally-friendly materials. During assembly, the stable brass housing with extra-thick walls reduces the danger of damage caused by excessive torque. All threads are of high surface quality and correspond exactly to the required tolerances, for optimum fit into the threaded hole. In addition to oil pressure sensors, DT® Spare Parts offers all further sensors for trucks, trailers and buses, for example ABS/EBS sensors, rotational speed sensors, temperature sensors, level sensors, boost pressure sensors and wear sensors.